In honor of our #10for10 campaign celebrating our 10th year anniversary, we ask our supporters to make a pledge of $10 a month for 10 months to raise money for our Scholarship Fund. 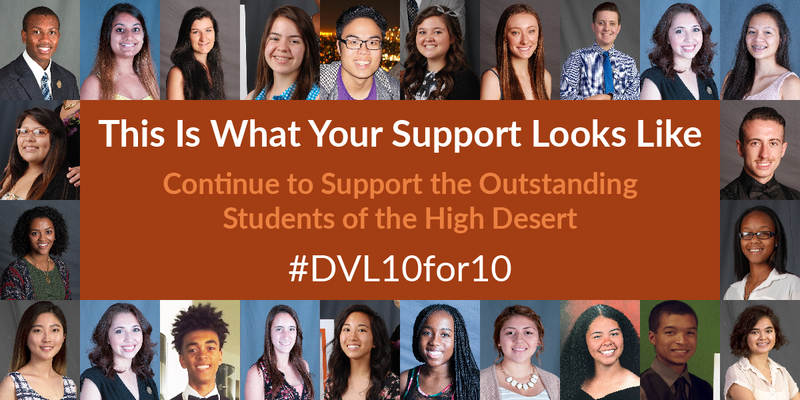 The DVL Scholarship Project has awarded over $12,000 in scholarships to 24 high achieving students from across the High Desert region each receiving $500.00. In addition, each recipient is assigned a high caliber mentor that provides advocacy to the scholar throughout the four year college experience to graduation. The DVL Project is delighted to learn that past students selected for the DVL Legacy Scholarships were also recipients of several other highly selective scholarships for their achievements in high school and their contributions to their communities. Help us to continue our support for outstanding students seeking higher education by making a #10for10 contribution today. A bright future is only $10 away. To donate to the DVL Scholarship Fund, click the donation button, there you will be able to enter the amount you wish to donate. Please feel free to give more than $10 a month if you are able! To make your generous contribution an automated monthly deduction be sure to check the “Make This A Monthly Donation Box“. Please note, this contribution is to Dreamers, Visionaries, and Leaders an affiliate fund of High Desert Community Foundation. Your donation will be billed from Streams in the Desert Foundation, Inc., the organization we use to manage our contributions. If you have any questions, please contact regina@dvlproject.com.